When Bricriu decides to hold a party, anyone who is anyone must put in an appearance. But Bricriu has no intention of getting in a few beers and a few bowls of nibbles. No, Bricriu’s feast will set the greatest heroes of Ulster at each other’s throats and send them racing off on adventures throughout Ireland. Join the Story Archaeologists as they revel in this rumbustious epic exploring a selection of Dindshenchas stories along the way. The link to download this podcast to the iTunes app on iPad is invalid. Would you please look into this? Blessed Be Brotherkith. First of all, thanks for all these wonderful podcasts and related materials. They are a real treasure trove, making accessible a too-neglected part of our culture. I’m pretty much a geek and into fantasy and folk tales etc, but there is a lot of stuff in these podcasts that I hadn’t heard of before, nor seen presented in the global, interlinking way that you are doing here, rather than as a series of standalone stories. I started with the first Battle of Moytura podcast and have been following avidly since. The podcasts strike a nice balance between enjoyment of these entertaining far-fetched stories as stories and examination of them in a scholarly way. I am surprised that there isn’t more discussion in the comments. Perhaps it’s hard to comment on long podcasts, as most people listen while doing other things, or travelling or whatever, and these podcasts are very detailed and packed with information, so it’s hard to know where to start once we’ve listened to the whole podcast. There’s so much in them that perhaps we’d need to take notes as we go. The fact that you are so thorough between you at covering so many of the angles and side-roads of the texts also leaves it hard for dilettantes like myself to add anything. Not that any of these are complaints, just excuses, perhaps, why some of us haven’t been commenting enough, while still enjoying your conversations. As someone who occasionally posts on blogs elsewhere I know that listener/reader response usually goes a long way in inspiring further instalments. I hope your hit-rate or whatever it is called is high enough to encourage you both to keep going. I’m sure there are a lot of us out here who really appreciate your work here and really want to see more. I’d encourage listeners to interact more with the site if they are enjoying it, as it is one way of rewarding the podcasters’ fine work. I think this rambling preamble shows that I enjoy thinking about the context stories are told in as well as the stories themselves, which is probably another reason I really enjoy these podcasts. The first half of Emer’s speech, listing her many enviable qualities, might be useful as my daughter is also called Emer, and I might have it put on a poster for her wall or something. At the end of the first half, she says “a nut of the heart I am clearly” How accurate is this as a translation? Has it lost something? Are there any other ways to put it? Pat Mills Sláine strip in 2000AD is a wonderful updating of these stories. If they aren’t faithful adaptions of them, they are very well researched indeed and draw on these old texts extensively. Notice that both artists got the detail of one eye shrinking and the other swelling ridiculously in those pictures, as well as other details. Are you familiar with Mill’s Sláine strip? Regarding Cuchulann’s story about wrestling the horse all day around Ireland, isn’t this his first capture and taming of the horse? Like the other horse, he captured it ‘as it emerged from a lake’. Remembering the Dinshenchas Isolde looked at with the Dutch academic about the horse that actually created a lake (up in Ulster somewhere, wasn’t it?) is there a common mystical association of horses and lakes? In any case, it seems that these are some kind of magical lake-dwelling horses. What’s with that? Also it could be the writer inserting some kind of mini-dinshenchas regarding the connection of those lakes to magical horses? And that’s all my rambling regarding the first part of the story! Thanks for the “rambling”! It is indeed motivating and helpful to get feedback of any kind. I’ll do my best to answer your points, but I might leave something out. If I forget anything, please log on again and hit me over the head with it! Firstly, regarding Emer’s and the other women’s poetry, it is on my “To Do” list, but I haven’t quite got there yet! In the next few weeks, there will be some samples plus translations (and audio recordings) from the poems. In the meantime, the line is question reads, is me a cnu cridi. This literally translates as “I am a nut of the heart”. The sense does seem lost to a modern audience. Nuts, in particular hazelnuts, were a strong symbol for wisdom and inspiration. This is particularly associated with the story of the Breadán Feasa, the Salmon of Wisdom, from whom Find gets his inspiration in one story. The salmon are said to get their wisdom by eating hazelnuts. We have the same theme in the Story of Sinann and the origin of the River Shannon. (See Series 1, Episode 1 and related articles). There is also a sense in which hazelnuts represent pleasure, warmth and sensuality. There is also a generative aspect to the symbol of the nut as a seed, most embodied by Eithliu / Eithlinn / Boand. (See Series 1, Episode 3, “Tales of Eithliu”). She is the kernel of a nut, and her function in a story is often to conceive, sometimes give birth, but nearly always to lose the child somehow or other. It’s the conception that is central to her character, and to the image of the kernel of the nut. As for Cú Chulainn’s horse-wrestling, my question-mark over it relates to the story Compert Con Chulainn, “The Conception of Cú Chulainn”. In this story, two foals are born on the same night as him in the Otherworld, and they are brought back and raised with the boy. In that tradition, Liath Macha and Dub Senglenn have been brought up with Cú Chulainn, so doesn’t mesh with the idea of “finding” the horses that appears in Fled Bricrenn. It is indeed interesting to have two horses emerging from lakes. 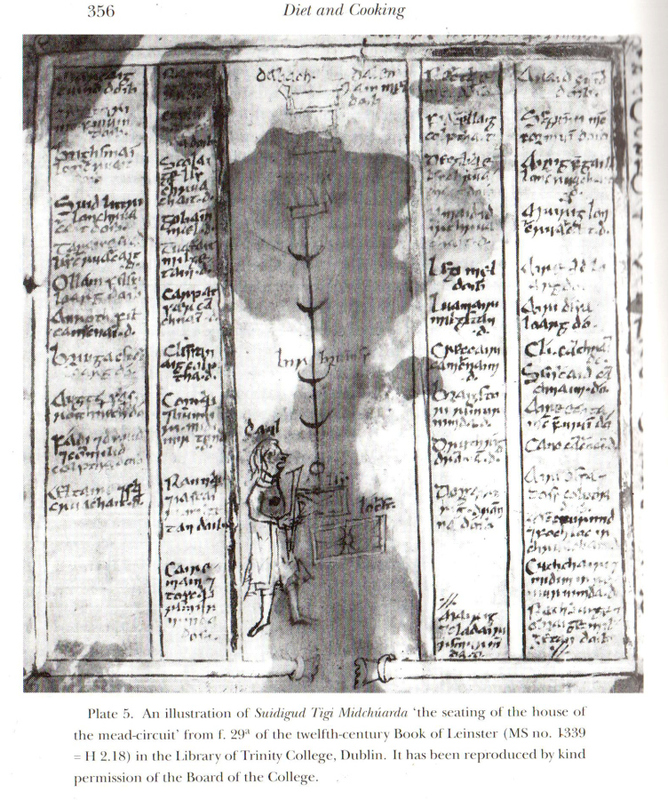 In the story of Loch nEchach (Loch Neagh) discussed in Series 3, Episode 1, “From Vellum to Hardback”, that lake is created by a massive puddle of horse-urine. There is a related tale of Loch Ree being created in the same manner by the brother of Eochu for the same reasons. In Ireland, horses seem to be associated with bodies of water. There are accounts from Ireland and Scotland of horse-racing on beaches happening at Lughnasadh, and a number of tales have horses emerging from the sea or travelling over the sea as if it were the land. I don’t especially know why this is, I just know that it is. The Sláine comics do have fastastic images – thanks for the links! It’s a looooong time now since I’ve looked at 2000AD, so I can’t comment on the “accuracy” of the stories. Also, the material covered in those tellings is often some which we really haven’t yet explored. But it is an excellent modern telling of the stories as understood in the 20th century. I agree that it’s significant that only Cú Chulainn experiences the warp-spasm. I think I mentioned in the episode that I see it as an Otherworld force inadequately housed in a This-World form. Phew! I hope that gets it all, but thanks for entering the conversation. 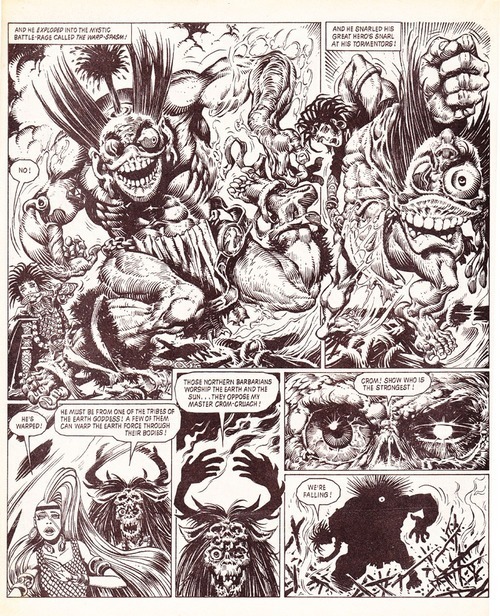 I stopped reading Slaine around the time the art went from sophisticated European line-art comics style to Heavy Metal album cover painted style. Probably not a coincidence, now that I think about it. Meeting the writer of Slaine was a highlight of my time as a comics fan. He said that writing Slaine was a way for him, as someone born and raised in England, to get in touch with his Irish/Celtic heritage. I see that Slaine gave us a classic case of conflating accounts of early continental Celts with aspects of the cultures of the Celtic Fringe taken from 2 thousand years leading almost up to the 20th Century. I see you have already begun to untangle those threads and seperate out what they had in common and how they were different, and I really look forward to hearing more about this. I get what you are saying about the 20th Century perspective in stories like Slaine exactly. In the late 20th Century, tales of Celtic fantasy seemed a natural fit for the concerns of feminism and environmentalism that were popular in the counter-culture. Whether a close reading of the actual texts Mills based the stories on supports that is another story. Also, the material covered in those tellings is often some which we really haven’t yet explored. I’m glad to read this, if it means that there is a lot of ground that you have mapped out to cover in future podcasts. Keep ’em coming!